This Friday 5 is about dream destinations. I had an opportunity to get out of the cold for a little bit in December and visit Hawaii. Here are some highlights of my trip. I know this is longer than usual but I wanted to fit everything in. We didn't do any sight seeing before Sunday because we wanted to save our legs. 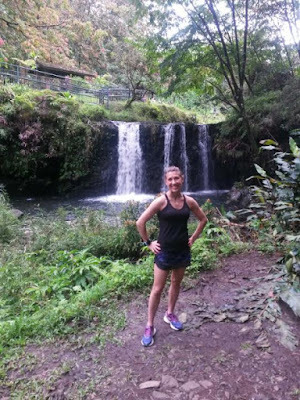 Sunday – Ran the Honolulu Marathon in the morning (Recap here). That evening we went to a Hawaiian Luau. Here we had a buffet filled with traditional Hawaiian food and mai tai cocktails. During our dinner we watched a show with ladies hula dancing and men throwing fire torches. 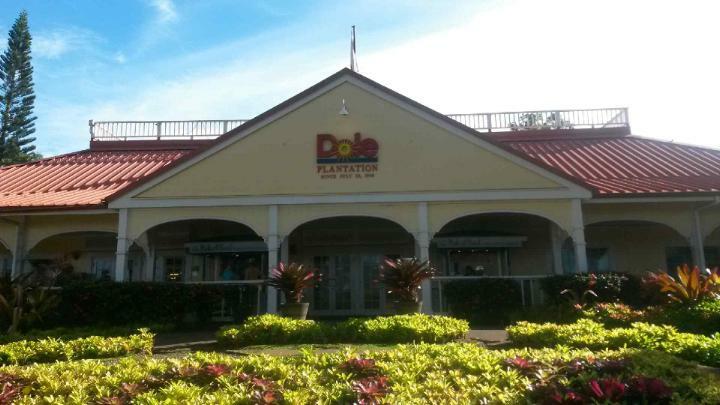 Monday- We drove up to visit the Dole Plantation. We took a tour of the plantation and learned how they grew the fruits. Afterwards we enjoyed a dole whip. While shopping in the gift shop they were handing out keys to see if yours could open the treasure chest. 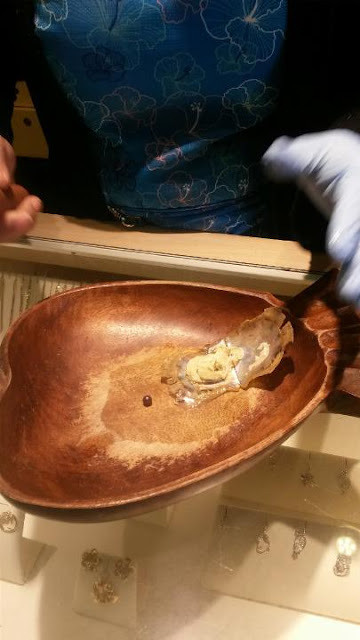 Luckily my key opened it and the ticket I picked inside was for a free oyster pearl….score! After the lady opened up my oyster I ended up paying to set it in a ring because it was a black one which means adventure. I thought it was very fitting. Afterwards we headed up to the North Shore to see some massive waves during a surfing competition that week. We stopped for lunch at the famous Giovanni shrimp truck and tried the spicy shrimp. There was even a note on the menu that said no refunds on this item (it must have been hot) but we like hot food so we were willing to take a chance. And oh my, it was really spicy and made our eyes water! After we ate that, we were really looking forward to cooling off with some Hawaiian shaved ice. Tuesday- We decided to take a day trip to Maui. After our 20 minute flight we met our tour guide to take us around the island. During this tour we saw many waterfalls and stopped at a state park for lunch. The road was one very narrow lane and very bumpy. The tour was fantastic and we learned a lot about the island . 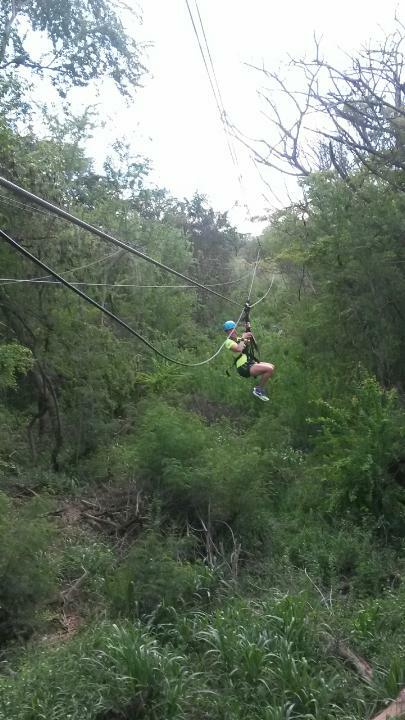 Wednesday- We wanted to go zip lining so we went to a place we found online. When we got there we didn’t even think it was opened because there was so much construction going one. Turns out, they had just opened 2 weeks ago. That should have been our first clue. It was fun and we did several zip lines, but none of them were up very high and our views were nothing but some trees. We wished we would have done the tour packaged ones that offered the scenes from Jurassic Park. That tour would have been a bit more expensive (and I never saw the movies), but I think that would have been more exciting! Thursday- We got up bright and early to head to Pearl Harbor. Again, this was another tour package we could have done but thought we would try to do it on our own since we had a car. We were told if we were not there super early we may not being able to do the tour because they only let the first 4,000 people tour. We arrived just after 6 and were already the 4th people in line. The first people in line were sitting in lawn chairs they brought. I wonder how long they have been there waiting. Closer to 7 am the lady that worked there walked down the line and gave us some brochures and showed us some packages we could purchase. We thought we would decide what tour we wanted to purchase once we entered. After we entered we were given tickets and were told the show starts in 20 minutes. 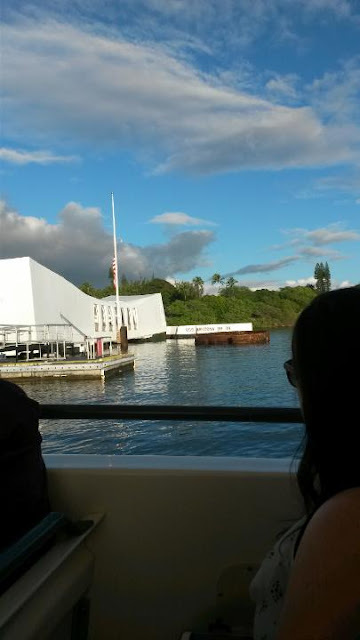 We lined up in front of the theater and watched a 25 minute video about Pearl Harbor and then exited out to get on a ferry to take us to the USS Arizona observatory deck. Inside listed everyone’s names that was lost in the horrible tragedy on the wall. On another wall the survivors that have since passed are listed. Their family members bring their urn and a professional scuba diver takes it down to the Arizona and releases it back with their shipmates. After the ferry brought us back we walked through the museums and saw pictures and artifacts of Pearl Harbor. When we were ready to leave we wondered what the packages included that you could have purchased because we saw and did everything we wanted to for free. As long as you go early enough you will have no problem doing what you want. After we were done visiting Pearl Harbor, we took a hike up Koko Head Trail which was quite the experience so I'm going to share that in a separate post since this one is already long. This was an amazing trip and I’d definitely go back. If I ever do, I would like to visit the other islands. This is a place that should be on everyone’s bucket list! Thank you if you read to the end. I loved the trip as well. I wish we had more time to see more of the other Islands. I may have to start eating oysters! And going to Hawaii! I hate oysters, but love the pearls. Hawaii is divine and I'm so glad you enjoyed it! Lucky you with that black pearl. How appropriate that it symbolizes adventure. We were there years ago when I was preggo with Thing 2 and the Caveman ran the Maui half. My how times have changed! We were considering running Maui, but the Honolulu worked better with both our schedule. It really is! I would love to visit back. I have only been to Hawaii as business trips and tacked on a few personal days, so I actually haven't done a ton of stuff! I really enjoyed reading your recap as that would help me plan my next trip and what id like to do! Hopefully next time you visit you will have plenty of time to do all the fun activities. We only spent one short day on Oahu when we first visited HI (cruise), and that was mainly because we both really, really, really wanted to visit Pearl Harbor. Which we did. There is so much to see, one day surely is not enough time. I haven't been to Hawaii but I would absolutely love to go there for a racecation! I think going there and not would be just as fun! What a fantastic trip! I hope to get there to run the Hawaii Marathon someday. I'm planning my 40th birthday - little does my husband know! :) Thanks for the linkup! That would be a great birthday vacation! We went to Maui in 1999 but I'd love to go again (right now because it's freezing!) ;) Looks like a great trip. I'm not a superfan of marathons in heat, so I might opt for a shorter race! Maui was neat to go to but I felt that it was really desolate opposed to where we were staying in downtown Waikiki. I went to Hawaii about 10 years ago and loved it. Pearl Harbor is an amazing experience. I really need to go back! Great pictures! Thanks! There is just so much to see in Hawaii and so little time. It sounds like a great trip! Hawaii is on our list for this year so hopefully we'll make it there in the Fall. I think fall would be a great time to visit there! I've been to Oahu and Kauai, and enjoyed both. Lilo and Stitch takes place on Kauai, which was fun to know. "Isn't it great to be on an island with no big cities?" Well I thought Honolulu was a big city. Now Maui I felt like I was on an island. I'd like to visit Kauai next time I go back. OK... I am in total love with the ring setting. I've got a new obsession with pearls so love you saw it come out of the oyster & you have your own adventure in getting it. Thanks. The setting is called the wave, very fitting isn't it? We loved our trip to Hawaii back in 2011. We spent two weeks there for our honeymoon and I'm so eager to get back. There's just so much to see and do and I don't think any length of time is enough to see everything on all of the islands. Kauai is next on our list to visit! I would have loved to spend another week there. Kauai and the Big Island is on my list for next time. Been to Pearl Harbor, Kauai, and Maui. I think you did the right thing at Pearl Harbor. We were with a tour, and we totally felt like we would've been just fine to have done it on our own. Kauai was my favorite. So beautiful. I ran a half marathon there too! Pictures just can't do Hawaii justice. Your ring is beautiful. I brought home a bracelet with black pearls. Thanks. That was probably my favorite item I bought while I was there. I have heard such great things about the Kauai island. Next time for sure! Thank you! I didn't think I would enjoy it as much as I did. It is definitely worth the trip! I've been to Hawaii, but it was so long ago, I don't remember it all. We spent 3 days in Oahu and 4 in Maui... I do remember we like Maui best. While we were in Maui we did not visit the resort area. Though it was beautiful, we felt like it was way too quite. We went to Hawaii on our honeymoon 25 years ago. Little did we know that my husband would start working for a company based there and we would live there part time for the past 4 years. I'm new to your blog or I probably could have given you a few tips! The Pearl Harbor packages are for other ships that are at the harbor - the USS Missouri, the Bowfin Submarine and other museums. There is so much to see and do on the islands we never get bored or "island fever!" That is so true. There was so much to do, I wish we had more time there. Sounds like an amazing trip! I love your ring. It's so beautiful! Thanks you! It is my favorite. Aloha! 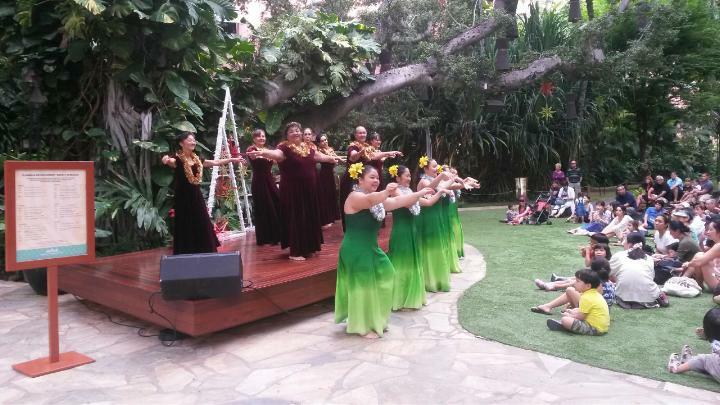 What a fun trip, I absolutely love Hawaii I'd visit every year in the winter if I could! 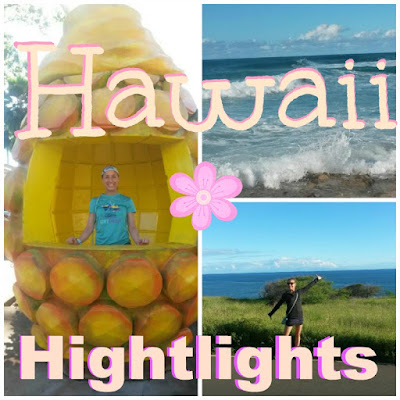 Your Oahu adventures are very similar to some of the things I did my first time there, there is so much to see and do it's hard to get it all in. Then you add the want to relax on a beach, yup Hawaii is a place I need a few weeks of each year, LOL If I am going to dream! Love all your pictures, the ring is super cute!!! Thanks!Yeah I would love to visit again. So much to do there! It rained while we were there every now and then but cleared up quite nice. Kauai and the Big Island are on my list for next time. Wow !! Hawaii sounds amazing !!! And that pear earring is perfection ! I love it ! It was! I was happy to have the pearl put in a ring setting. I love Hawaii, but I've only flown through Oahu. We've been to the Big Island, Molokai, and Maui (only for half a day!). I love your new ring. I want to go back! Hawaii was awesome! I would love to go back and visit all the places I didn't get to last time. I went to Hawaii to visit a friend who was living there. It was definitely a fun trip, but I'd like to go back again to do some proper touristy adventurey stuff. I was in college at the time and we didn't really do a lot. lol. 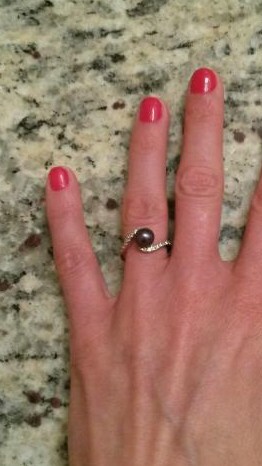 Your pearl ring is fabulous! What a great trip you had! I ran the Kona Marathon. I wish we had zip-lined. Maybe next time! Snorkeling was the best, though! Wow what an amazing vacation! Looks like you had some great adventures and definitely packed your days. That is so cool about the black pearl and I absolutely love that ring you made it into! How lucky!!! It's so pretty! Hawaii is a place I want to visit so badly! What a fun trip! I love the black pearl! I got a strand of them for my birthday :) How lucky to make a race cation in such a beautiful location!